Work to prepare the 95-year-old vessel for the salvage operation has been ongoing since the weekend. All aboard were rescued when she crashed on the rocks six weeks ago. THE WRECK OF the Tall Ship Astrid, which has been settled on rocks off the coast of Cork since the craft ran aground six weeks ago, will be removed from the shoreline by early next week, it is planned. 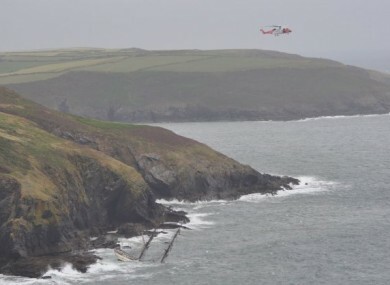 All thirty people on board were rescued when the sail training vessel was forced onto the rocks near Kinsale after its engines failed on 24 July. The plan to salvage the 95-year-old tall ship was approved last week by the Irish Coast Guard; the operation will be carried out by the Bere Island-based Atlantic Towage and Marine company after a deal was agreed with the Astrid’s insurers. A huge crane that will lift the craft out of the water and onto a barge is being transported to Cork from the UK. Both are due to arrive at the wreck site tomorrow or on Thursday, after which it’s expected the 42-metre steel-hulled ship will be taken to dry dock for assessment. Work took place on Sunday to clear some of the ropes hanging from the rigging, operations officer with the Coast Guard Hugh Barry told TheJournal.ie. Divers also inserted wedges between the ship’s fuel containers to secure them and to ensure there will be no leakage of diesel when the lifting operation takes place, Barry said. Additional dives are expected to take place at the site today to further prepare the vessel ahead of the crane’s arrival. “Once the crane gets here we’re looking at a one- to three-day period before it’s out of the water,” Barry said. Experts will assess the extent of the damage to the ship’s hull once it arrives in dry dock, but it is not expected the craft will sail again. Built in The Netherlands in 1918, the Astrid was allegedly used for drug-smuggling at one point. It was found abandoned off the English coast in the early 1980s, and was later overhauled and relaunched. Email “Operation to lift the Astrid from the sea should be completed by next week ”. Feedback on “Operation to lift the Astrid from the sea should be completed by next week ”.